WARNING: there is a picture of my breast in this post. DO NOT OPEN if you think or know you will be offended at seeing my bare breast. You know how you can tell when I am doing well? I don’t write. And when you ask me how I am doing, I say something like “I am really, really good.” Then there is this long silence—an awkward pause between us—the part where I would normally dish about how busy or tired or crappy my life/house/job/marriage is, but I can’t, so I don’t. My life, is GOOD. Then the news on the vote on Amendment 1 in NC comes in. FB wants to know what is on my mind. Well, I wanted to rant about the poor decision made on the part of North Carolina. But instead, I would like to spread some positive energy and tell you about a very important person in my life. Her name is Rachel Swan and she is our beloved GM at Pizzeria Lola. Hiring her has been integral to our success and quite possibly the most sound decision I’ve made as a business owner. But more importantly, I am honored and fortunate to call her my friend. Thank you, Rachel for being you. You know what? THIS is who I want to be. Of course I am angry, and hurt, and yes, I am totally rolling my eyes at YOU, supporters of the amendment in North Carolina. But you know what else I am? Happy. Loved. Supported. Married. 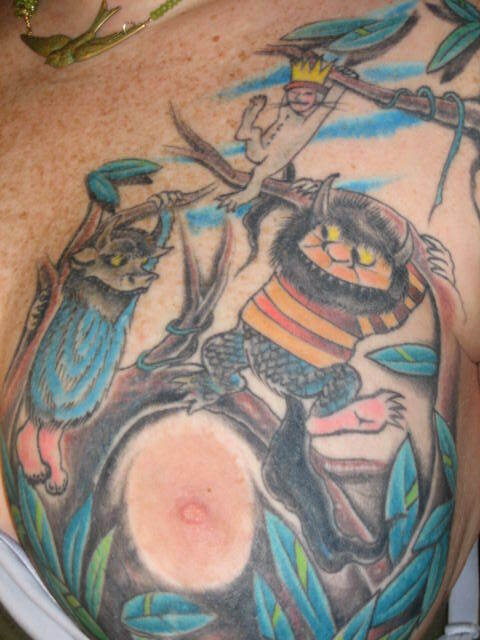 I have a tattoo of Max and the Wild Things on my chest, and yesterday I found myself looking at it all day. I was caught between feeling grief and joy. I’ve carried my mom, her voice and spirit on my chest, next to my heart. We used to have this amazing ritual; we’d read Where the Wild Things Are (or Mickey and the Night Kitchen or Chicken Soup with Rice or Higglety Piggelty Pop!) every night before bed. These memories are my joy, my happy place. Maurice and mom, both full of light AND darkness. Both having lived and now, died. My muse shows up in these hurting dark places, urging me to write. Today I write anyway, living fully into both spaces, but leaning towards joy. Its not pithy or clever, it just is what it is. I am grateful for all those around me who remind me life life IS beautiful, and defeat, death and darkness will not, can not have the last word. Let the wild rumpus begin. Let’s slide down into the Night Kitchen (my favorite) and cook up some change. I ❤ you. And then I cry for all of it. Beautifully written dear friend. I hope to always be part of your wildest of rumpum. Cheers to you for living your love on the inside and outside, close to your heart and yet not closed to others, so that we may bear witness to it’s genorosity, devotion and giving spirit. I am reminded of a bible verse, in regards to the decesion in NC. It’s moment like this that I try and remember that those who cry the name of God the loudest in their effort to minimize the value of others, forget that God is love. I know I am lucky because how horrible would it be to spend my life focused on hate instead of rejoicing in the love I do have? Good for you Rach for being able to keep your eye on what matters. Inspired. Loved. Dorked. Blessed. Triumphant. Moved. Bruised. Fueled. Anticipatory. Romped. Happy. Bingo. I too am saddened and disappointed in the people of NC who voted for the ammendment yesterday! Truly a lack of respect for many of our brothers and sisters in this state and beyond. I already signed an appeal for the ammendment this morning. I have to have faith that in time those who hold so much fear and lack of true understanding will truly understand and accept others. We are to love one another in all our diversity! I pray that one day all of us will accept each other unconditionally and with God’s call for us to love with gladness in our heart. Thank you for what you wrote tonight. You are one dear lady!